The Decline and Fall of IBM - End of an American Icon? IBM is in serious trouble. Big Blue, as the company is known, tends to rely on magical thinking for its success, but that magic ran out a long time ago. The trouble began back in the 1990s and IBM had to hire, for the first time, an outside CEO. Lou Gerstner saved the day, pushing IBM into services with spectacular results, but not without consequence. As services became commoditized, IBM could compete only by offshoring the work. Quality suffered. In addition, Gerstner's compensation was very high, which impacted IBM negatively. In IBM history, only the Watson family hit rich running IBM. Later CEOs, like John Opel and John Akers, lived comfortable lives with many perks, but weren't BIG RICH. That changed with Gerstner.IBM has essentially sacrificed both its customers and its employees in the name of earnings. The company has cut labor to the bone, offshored as much as possible, and dropped quality. Acquisitions are deliberately underbid, the under-delivered. These moves, combined with share buybacks, have kept earnings growing until recently, when the house of cards began to fall. IBM's current CEO, Ginni Rometty, has outlined an earning goal for 2015 and she is not afraid to destroy the company to achieve it. This book outlines IBM's fall from grace, where the company is heading, and what can be done to save IBM before it's too late. 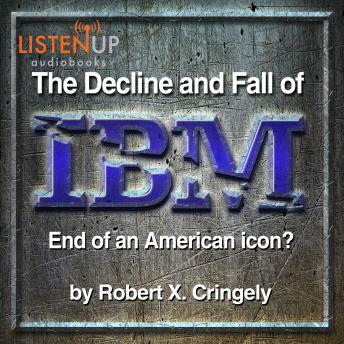 Decline and Fall of IBM - End of an American Icon?